I found this painting on eBay recently. 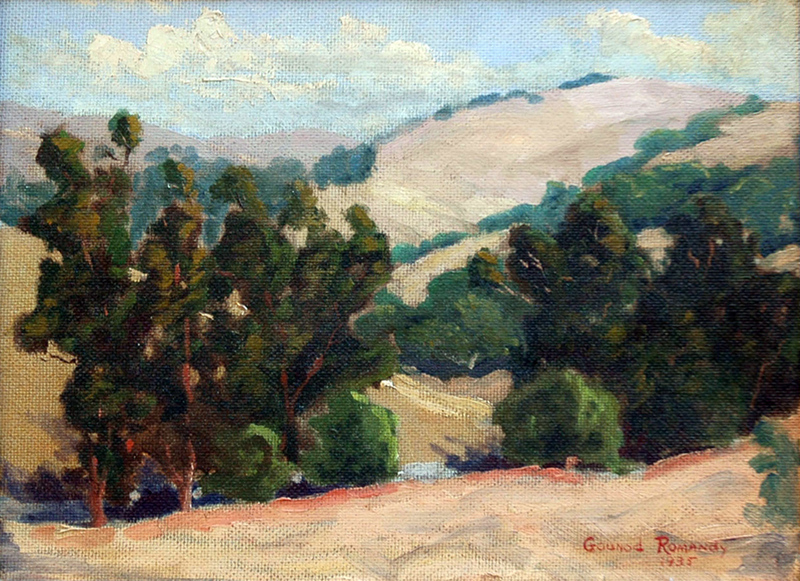 It's entitled "Hills of Covina, California," and it was painted by noted California impressionist artist Gounod Romandy (1893-1942) in 1935. It's only about a mile from our old Covina home. The painting was actually done about 25 years before we lived there, but the vista remained relatively unchanged until the 1970s, when this little dale began to be developed. Back when me and my buddies had those hills all to ourselves, they were alive with coyotes, jackrabbits, pheasants, tarantulas, even the occasional rattlesnake. Today, the hills are completely covered with houses. How amazing to see an impressionist interpretation of our hills in their natural state. I can even recollect what the place would have smelled like on a beautiful summer's day like this, and call to mind the sound of a gentle breeze blowing through those tall grasses and trees. It truly was a wonderful place to grow up.